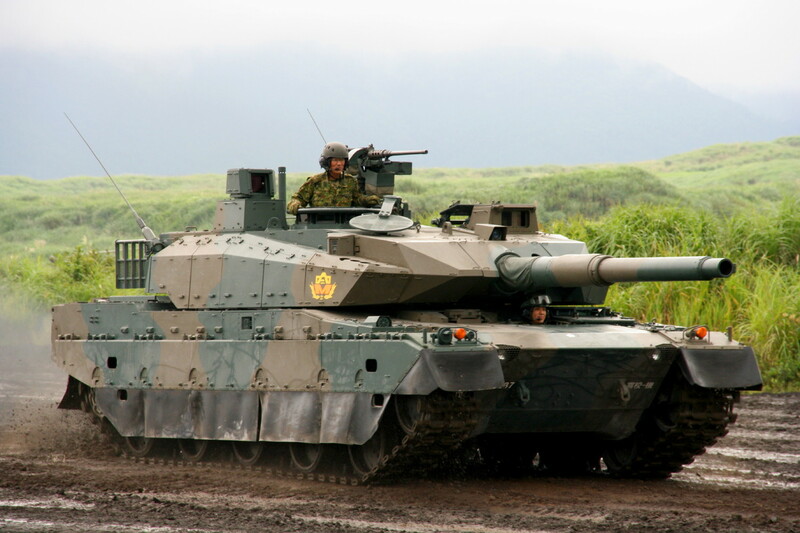 A tank is a big, heavy armored vehicle that is used for war, and usually travels on continuous tracks. Some of the weapons of a tank are cannons, machine guns, and grenade launchers which are mounted on turrets and launched. Some tanks have smoke generators to hide their positions from enemies. There are four crew members in a tank and they are the driver, gunner, commander, and loader. The main battle tanks can weigh up to 35-70 tons and the armed reconnaissance vehicles (ARVs) weigh 10-25 tons. Tanks can get up to the speed of 50 miles per/hour on the road, or if the ground is rough and uneven they go 10-20 miles per/hour. They can make zero turns, and go up or down a hill as steep as 30 degrees. The guns of the modern tanks are 120-125mm which can hit a target 1 mile away while going 50 miles per/hour. There is also a machine gun set further back on the tank, usually fired by the commander. Tanks can withstand the heavy shocks of missiles, bombs, IEDs and guns because of their heavy armoire. Tanks are very useful weapons because they can run over small buildings and barbed wire fences; destroy several things with their guns. Also they can withstand very heavy shocks off almost anything including radiation. The first tanks were used and made by the English against the Germans an 1916. These tanks were very slow and clumsy. In World War II all of the nations that were at war used tanks as one of the main striking power along with airplanes. A war tank in action.